Embark on this 6-day explorer tour of Denali National Park and Preserve, a six-million-acre wonderland of sprawling wilderness at the foot of the Alaska Range. Travel deep into the heart of the park along the highly restricted 95-mile Denali Park Road as you make your way to Kantishna, a mining district and location of Denali Backcountry Lodge. Enjoy the stunning backdrop of Denali towering over vast swatches of colorful high-alpine tundra, low-elevation taiga forests blanketing the river plains and glistening lakes. On clear or partly cloudy days, look up and witness Denali’s elusive peak before turning your attention back down to the many species of wildlife that call Denali home. The lodge, nestled along Moose Creek, is the epitome of coziness and comfort with inviting creek-side cedar cabins featuring private baths, wildly beautiful views and plush beds. During your stay, venture out on one of many activity options including morning yoga, bike rides, gold panning, historical and cultural presentations and guided hikes, and take a break to feast on fresh, wholesome meals in between. This once-in-a-lifetime vacation will satisfy your every sense. Please note that deposit requirements and cancellation policies for this tour may differ from those of Gray Line Alaska. Luggage restrictions apply on the bus to Denali Backcountry Lodge – due to limited bus space guests are only allowed one 35-pound SOFT SIDED piece of luggage. Other luggage can be stored at a nearby Denali hotel and retrieved on your arrival back to the park entrance on day 4. Upon your arrival, we will meet you at the airport and transfer you to your hotel. Tasty restaurants, a vibrant art scene, historical and cultural museums and a large network of lush greenbelt trails and hikes will provide ample options for you to choose from for a memorable day in Alaska’s largest city. Overnight in Anchorage. Enjoy a morning at leisure or choose an optional morning excursion. 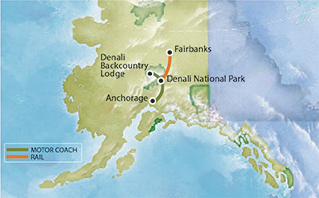 Then board a luxury railcar and travel deeper into Alaska’s interior past magnificent scenery. Transfer to your Fairbanks hotel upon arrival. Overnight Fairbanks. We will provide transportation to the airport and bid you farewell as your Alaska vacation comes to an end!